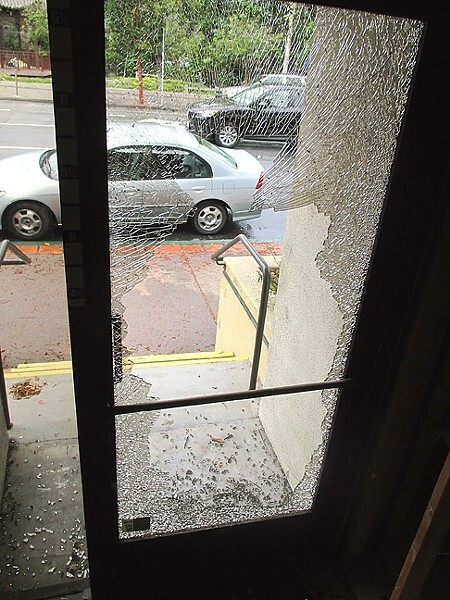 On the morning of June 9 several San Luis Obispo bankers, tellers, and loan officers—and a few geniuses and gadget pushers—arrived at work to a mess of broken glass. SMASHING! : New Times took a quick walk about to assess the the trail of broken windows in downtown San Luis Obispo after a vandalism spree in the early hours of June 9. This is a broken glass door at the old office location of Heritage Oaks Bank. The building is now planned to be the new home of the construction and design firm Stalwork Inc. Bank of America politely declined to let New Times take a photo of its broken window. The word of broken windows spread as reports trickled in from across town, eventually totaling 10 banks and the downtown Apple Store. Beginning at 3 a.m. that morning, the San Luis Obispo Police Department responded to burglar alarms and vandalism reports. Police think several small metal ball bearings—possibly launched from slingshots—found inside many of the buildings, caused the damage, Sgt. Kurt Hixenbaugh said in a press release. The estimated total cost of damages is still being tallied, but the Apple Store reported that a large window broken at the store’s Morro Street entrance will cost about $20,000 to replace. Hixenbaugh told New Times that investigators are exploring all avenues to gather clues and information, including collecting video surveillance footage from the banks and neighboring business. Because of in-house bank security precautions, the 10 vandalized banks haven’t yet released video footage from that night. Hixenbaugh said each bank branch will first send the footage to their respective corporate offices, where it will be reviewed, burned onto DVD, and sent by mail to the police department.